Custom firmware for popular wireless routers is nothing new. There's DD-WRT, Tomato, OpenWRT... and so many others that I'm not going to take the time to name them all. Despite being quite different in nature, though, they all aim to do one thing: make your wireless router better. Kind of like all the different flavors of custom ROMs for Android devices – it's really a matter of preference which one you choose. But what if you could have Android on your router? We all know how powerful and customizable Android is, as well as how limitless the possibilities really are, so why not? A new project called Droidifi – which has already been funded by nearly 200% on Kickstarter – aims to bring that very idea to reality. Essentially, a group of wireless developers with over a decade in the business decided they weren't happy with the current state of wireless routers. Like any good dev team, the group decided the only course of action was to create their own custom firmware. Given its flexibility and power, Android was perfect for the job, and the project is even based on 4.2.2, so it's the newest thing off the presses. In its current state, Droidifi will run on the most powerful 802.11ac routers – the Cisco/Linksys EA6500, Netgear R6300, and ASUS RT-AC66U – though support for additional models should come in time. The initial funding on Kickstarter was just needed to really get the project off the ground. So, Android on a router – cool, but what can it do? 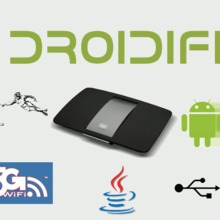 According to the project's Kickstarter page, Droidifi will give routers a power boost, as it fine-tunes the Wi-Fi radio for the best possible output and range. It will also allow for mesh networking, which lets multiple routers to be plugged into the original, thus forming a distributed wireless network. Any router running Droidifi will also have access to the Droidifi appstore, which is a place where other developers will be able to upload their apps to further enhance the router. The firmware itself will be available free of charge, but access to the appstore will require a quarterly fee of five dollars. Gotta make that money somewhere! I bet you're wondering how manipulating Android on a device with no display works, right? It's actually a pretty simple solution: through your web browser. A portal to the router will essentially run a tablet-optimized version of Android in your browser, which is where you'll tweak all the router's settings. It's worth noting that the first video was shot in an emulated environment and the actual experience will be much smoother, according to the member of the Droidifi team we spoke with. The firmware will also support USB devices – such as cameras and storage devices – in the initial release, and the team plans on adding support for "any USB device you could conceivably plug into [a] router" as time goes on. It also allows for any content stored on said storage devices to be streamed across the network, essentially turning the router into NAS, as well. So, how can you get in on the action? Well, the project is already funded on Kickstarter, but you can still give to the cause if you wish – it has been proven time and time again that, the more a project makes over its original goal, the more features it gets in the initial release. Otherwise, just lay back and wait for everything to materialize. In the meantime, though, you can get the full details on both the Droidifi Kickstarter page, as well as the project's website.